The Coventry Stakes Group 2 is the first juvenile contest at Royal Ascot. This race for colts & fillies is run over 6f & noted as a source of many champions. Named after the 9th Earl of Coventry, it has a long history. It was first run in 1890 won by a horse called The Deemster. Historically, Sir Gordon Richards is the leading jockey with 9 wins (Manitoba 1933 - King's Bench 1951). While the leading trainers are Frank Butters (Fairway 1927 - Palestine 1949) & Fred Darling (Lemnarchus 1930 - The Cobbler 1947) respectively. Both trained 7 winners. Since 1980, Aidan O'Brien has proven the most successful trainer winning 6 races, a number being outstanding thoroughbreds. Other notable trainers in this modern era include Richard Hannon. The Coventry Stakes Group 2 is run on Tuesday, 18th June, 2013. Whether past or present, the Coventry Stakes Group 2 has seen an number of incredibly talented horses. In truth, the Coventry Stakes is often a tip for future stardom. High Class Equine details our Top 10 Coventry Stakes Group 2 Winners. This son of champion sire Hampton was a bay, trained at Newmarket at Melton House Stables by Matthew Dawson, owned and bred by Lord Rosebery from Crafton Stud. In 1894 Lord Rosebery became Prime Minister of the United Kingdom. Interestingly, this colt was unnamed when he won his debut in easy fashion in the Woodcote Stakes at Epsom Downs. Up until 1946 racehorses in England were allowed to race without an official name. At that time he was simply known as '' The Illuminata colt'' after his dam. His second start saw him compete at Royal Ascot in the Coventry Stakes, where he started 6/4f. He led from the start and won by one and a half lengths. After a three month break he returned to win the Champagne Stakes at Doncaster easily from his sole rival Sempronius. After this victory, he was officially named Ladas. His final contest at two saw him race in the Middle Park Plate (Stakes) at Newmarket. Starting 1/2f he was never in danger and won by two lengths. After a successful season he was made 5/2f for the Derby. Ladas headed straight for the 2,000 Guineas when making his three-year-old debut. In an eight-strong field, ridden by Jack Watts, it turned into a dual with Dewhurst Stakes winner, Matchbox. After matching strides, Ladas ran on to win by to one and a half lengths. Bookmakers made him 8/13f to win the Derby, which looked to be his next engagement. However, connections decided to take an easy option in the Newmarket Stakes priced 1/12f. He won ''unextented'' from St Florian against four opponents. Such was his popularity that not only was his price cut to 4/9f he was protected by a group of police detectives. By the time of the Derby, Lord Rosebery's colt was priced 2/9f, with old adversary Matchbox a worthy second favourite. Ladas traveled in ''grand style'' looking an easy winner but Matchbox responded well and for the first time in the bay's career he was pressed and ''forged ahead'' to win by just than two lengths, the remainder six lengths further back in third. As a student Rosebery predicted he would marry an heiress, become Prime Minister and win the Derby. At Westminster, Ladas' win was cheered in by the House of Commons. However, some churchmen criticised him for being involved with the ''dishonesty and degradation'' of the racing world. Rosebery replied that he had ''no vestige of shame'' in owning a good horse and presented one of Ladas' winning horseshoes as a gift to United States Ambassador Thomas F Bayard. 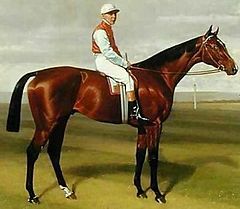 Ladas was then matched against Isinglass who won the Triple Crown in 1893, for a £10,000 price contesting the Princess of Wales' Stakes over one mile at Newmarket. The early pace was slow, but Watts moved to the front at the furlong pole but immediately challenged and overtaken by Isinglass and Bullingdon. The former won by a head with Ladas finishing third, who was eased when beaten. Some considered the slow pace a reason for his defeat. The Eclipse Stakes at Sandown met again over ten furlongs and after Isinglass looked to go a stride too fast chasing the outsider of the field who went full throttle. However, Ladas was unable to overhaul the favourite who won by a one length. Watts admitted he had been beaten by a better horse. Ladas was sent to Doncaster for the St Leger with hopes high of winning the Triple Crown. The fractional odds-on favourite went clear. However, the outsider of the field, Throstle priced 50/1, pulled ahead in the closing stages to win by three quarters of a length. He raced once at four after many training problems to finish fourth. He was retired to stud where he sired Classic winner Gorgos (2,000 Guineas) and Troutbeck (St Leger). He was retired from stud in 1912 & died in 1914 at his owner's stud at Mentmore.